November is Picture Book Month! It’s also the last month to suggest a picture a book for a CLEL Bell Award. Colorado is doing some super cool stuff around early literacy. The Bell Awards are their “annual recognition of five high-quality picture books that provide excellent support of early literacy development in young children.” These awards are a great reader’s advisory tool as well as providing ideas for storytime sharing. Check out the 2016 winners and the early literacy activity sheets that go with them! 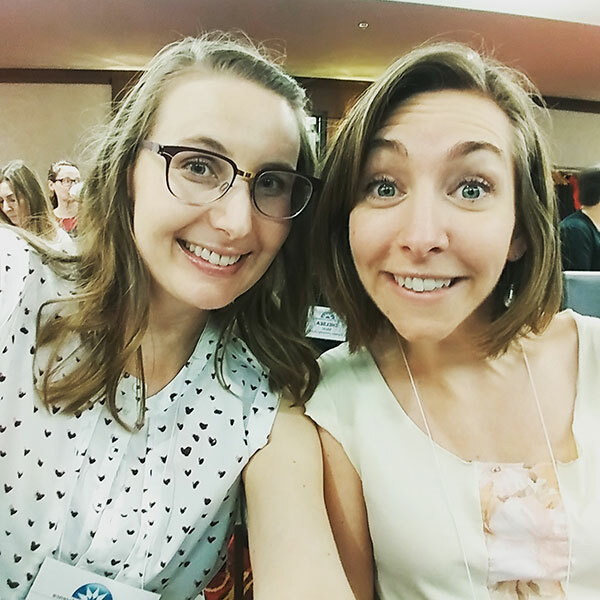 When the Bell Awards first launched, we participated in a blog tour highlighting books that support the early literacy skill singing. This year I wanted to share some of my suggestions for each early literacy practice for the 2017 award. You can suggest titles until November 30th, 2016 so it’s not too late to get yours in too! Here is a list of selection criteria to follow. Many of my favourites have already been nominated this year! 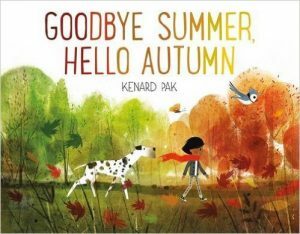 In this beautifully illustrated autumn tale, a child walks through forest and town greeting parts of the natural world and learning how they change with the seasons. This book models conversation skills and has worked the best for me when I take on a distinct voice for the child and different voices for the things that respond to her. After reading it with my niece we took a fall walk and imagined what all the plants and critters would say to us. An excellent choice for promoting the early literacy practice of talking! Two of my other favourites for this category are Return by Aaron Becker (who doesn’t love a good wordless picture book to get kids storytelling!) and Tell Me a Tattoo Story by Alison McGhee; illustrated by Eliza Wheeler. Follow a young girl as she walks through her neighbourhood noticing all sorts of shapes hidden in the city landscape. This book goes way beyond a simple concept book, inviting readers to search for shapes in everyday objects and in the world around them. I suggest this title for the “Write” category because learning shapes is the very first step in learning letters. When kids can distinguish between a circle, square, and rectangle, they apply that knowledge to the lines and arcs that make up our alphabet. 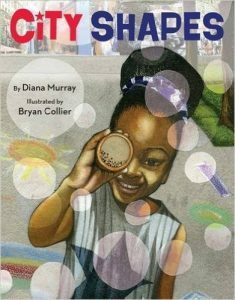 This book models to caregivers an easy way to practice identifying shapes which not only strengthens this early literacy practice but also contributes to a sense of community pride. Another book I would suggest for this category is Oops, Pounce, Quick, Run! : An Alphabet Caper by Mike Twohy featuring a dog and mouse chase game that promotes letter awareness. Cats, books, pirates – what’s not to love! A young boy decides to teach his cats to read only to find they aren’t as interested as he’d hoped. Super funny and engaging, this book gets to to the heart of print motivation – finding something you love to read about! 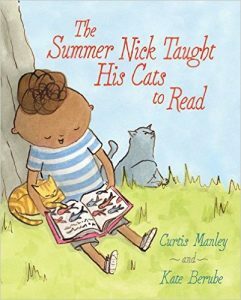 I also love that the cat gets its own library card and the book depicts Nick and his dad borrowing library books to take home. All the right ingredients to promote the early literacy practice of reading! I would also recommend Let Me Finish! by Minh Le; illustrated by Isabel Roxas for a silly tale of a boy who keeps getting his book interrupted. A vehicle-themed version of the classic children’s song. Nominating this one for obvious reasons – it’s so fun to sing! I like singable books that are a twist on traditional songs because they show caregivers you can play with music and create your own verses. I also love that Ms. MacDonald is right there by her partner’s side repairing and driving. In addition to the song there is a story that progresses through the pictures as all the characters – humans and animals – help to build a race track for a race truck. I also recommend Sing With Me! by Naoko Stoop for a lovely collection of nursery rhymes and songs that include suggestions for hand motions. A child explores the garden by playing in the dirt. So simple and so brilliant! This one is perfect for toddlers and encourages outside play that isn’t afraid to get messy. I suggest this book because it sends the message that play doesn’t have to involve expensive toys. Just step outside and get your hands dirty. We also know that children learn with all five senses and this book does a great job of showing how to learn by using your sense of touch. 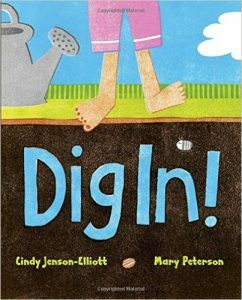 After reading this book I could see many little ones anxious to go out and play in backyards, parks, and gardens. Two of my other favourites for this category have already been nominated – the toddlerific title Blocks by Irene Dickson and the perfect preschool pick This is My Dollhouse by Giselle Potter. Have you read any picture books published in the past 12 months that exemplify one of the five early literacy practices? I’d love to hear about them and see them suggested for the 2017 CLEL Bell Awards! So, I pretty much love all of these books. 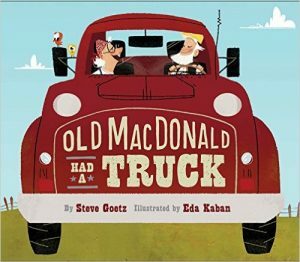 I particularly love Ms. Macdonald in Old Macdonald Had a Truck – that one really pleasantly surprised me. And as a bonafide cat lady, Nick’s cats just won my heart – I love their funny little expressions. Great choices all around! Hey guys! Love the blog! Just stumbled across it, and it has been a great resource for me (I work in children’s services at Toronto Public Library!). Keep up the great work! Lindsey, please, please, please suggest your picks for the CLEL Bell awards on the CLEL website! I know that several of the ones you mentioned are not suggested yet. They are great choices and we love your input…and we love that you mentioned the CLEL Bells on your website. Thanks! Thanks for the reminder! I entered my suggestions that haven’t been nominated yet. Thank you for all the work you do in promoting top notch early literacy resources! Making new purchases, and I know I can always trust your suggestions. Thank you Lindsey. Your work is very respected. Thank you, Bobbie! That was such a lovely comment to wake up to 🙂 I’m excited to see which picture books get a Bell Award this year too. Just saw this post, thanks for the CLEL Bell mention! I’m currently working in a CO library and on the committee to select winners. I’m curious, what did you think of this year’s winners? I’d actually only ever heard of Zoop! and The Library Book so they were all pleasant surprises this year. The work your committee does, especially preparing the early literacy activity sheets is so helpful!